Five individuals will be inducted into the new Student Life Hall of Fame at a reception held during this year’s Homecoming weekend. Faculty and staff who may know one or more of our inductees are invited to attend the Hall of Fame Induction Ceremony and Reunion Reception on Friday, Sept. 25, from 4:30-6 p.m. in East Academic Building, Room 253/262. Please RSVP by Sept. 17, through the Alumni homecoming website. The Student Life Hall of Fame recognizes those individuals who demonstrated an outstanding commitment to improving student life at Webster University through campus, or community, involvement and/or participation in organized campus activities. 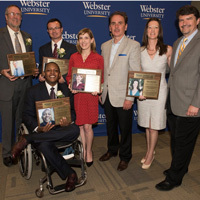 It is one of the most prestigious honors awarded by Student Affairs at Webster University to former student leaders and employees who had a significant impact on student life. Recipients are primarily recognized for their contributions to student life while on campus. Jennifer (Meyer) Starkey, ‘98: B.A. in broadcast journalism; president of SGA and UCB, orientation leader, UC student building manager, helped start Delegates’ Agenda program. Since the members of the inaugural Hall of Fame class were actively involved in the following groups, we are inviting current students and alumni who have been involved in these groups for a special reunion.